At first round of card dealing Banker and Player will be dealt 2 cards respectively. Face cards (Jacks, Queens, and Kings) and Tens are worth 0, while Aces are worth 1, all other cards are counted at face value. The object is to correctly predict which of the two hands (Player or Banker) will have a point value closest to 9. The point value of each hand is the last digit of the sum of the cards. For example, a hand of Jack, 4, and 9 has a point value of 3 (since 0 + 4 + 9 = 13). 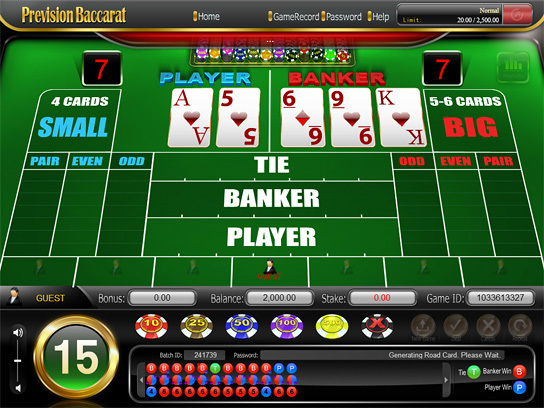 If either the Player or the Banker have a total of 8 or 9 on the first two cards no further cards will be drawn. The resulting hand is called a natural and the hand is over. If the Banker and Player scored 6, 7, is considered Tie.